"You believe that to defeat an enemy who will stop at nothing, you must stop at nothing. How's that different than 'blood must have blood'?" Suspenseful and riveting. Did the heroes just lose all the cards they were holding? With so much of the stories this season happening in distinctly different locations, we are forced to spend a lot of time jumping around the map. This episode was split pretty evenly in quarters. First of all, what's up with Raven? She's been a badass since first racing down to earth with a radio and devil-may-care attitude, but was it her time with ALIE that gave her the heightened computer skills? It's gotta be. I think. Artificial intelligence confuses me a smidge. If the dark circles under her eyes are any indication, it's not all sunshine and genius, and I'm just waiting for the other shoe to drop. Was Arkadia the island for misfit toys?? Poor Raven and Monty have really been put through the ringer, and this episode did not let up. Forcing Monty to delete his mother, in essence killing her for the second time, was enough to make me curse my TV. And then in the end it was all for nothing anyway?!?!? Kick them while they're down, why don't we?? Of course, Miller and his boyfriend still have each other and now Monty gets to cuddle with Harper and who hasn't been through it on this show... so I guess the earth in general is the island for misfits. I was all for Harper putting the moves on Monty for about .06 seconds then I realized she's going to die now, isn't she? Ugh. No no no no. I'm already done mourning it, though. Better her than Monty. Watching Indra, Pike and Murphy work together was like watching someone knit. I get the basic concept, but I still can't fathom having to do it myself. I don't know if I would have it in me to forgive and forget and let the guy I didn't trust an hour ago to have my back, and I know from experience that I can't take two sticks, yarn and a patient attitude and create any kind of clothing article. I think the trio would've had more luck if their plan didn't hinge on letting a few people run away as a distraction. Shame on them for not thinking that thing through. I get it, it's not like they had an abundance of supplies and time, but come on. Pike massacred hundreds with 12 men. Indra led armies for years and Murphy is the survivalist king. In the end, I guess it didn't really matter what the flaws in the plan were because Jaha is still working on his emotional manipulator of the year trophy. He sent Emori in to stall Murphy and it worked. Just in the nick of time to make destroying the backpack useless. And then Murphy broke our hearts when he had to leave Emori behind. Is anyone else loving Luna? I don't necessarily like or get behind her desperate need to sit this war out, but I can see where she's coming from. Her brother was also a nightblood. She killed him in the conclave before going up against Lexa, and realizing that she was the best fighter and could either kill her little friends or leave behind everything she ever knew, she walked away. Harsh. Ugh and watching her get waterboarded was no fun at all. It was painful all around. It hurt watching her suffer, it hurt watching Derrick watcher her suffer, it hurt watching Jasper's reaction to the whole mess, and it hurt watching Luna stand up to ALIE in a way no one has had the stomach to as of yet. And all this for characters that we just met! That's serious writing/acting chops right there. ALIE was really the only winner this week. She finally caught up with Clarke, Bellamy, Octavia and Jasper AND managed to permanently tear their plan to pieces. Not that they were having much luck putting it into motion in the first place. Murphy said that Jaha isn't in charge. That he's being controlled just like everyone else. I still don't think that's true. Jaha is the one that knows how to manipulate human emotions. ALIE is obviously the brains, and she didn't disconnect from Arkadia right when Jaha told her to, but without him how far would she really have gotten? There certainly wouldn't be so many people in the COL and I can only assume it was his idea to hide on the Ark. What is the likelihood that ALIE is just having some kind of identity crisis and wants to chat with Becca about 'what it all means' and the universe and stuff? Jasper has been grinding on a sore nerve lately, but there is something really lovely about him being attracted to these extremely unjaded women. It's obviously a place that he wishes he could go back to. Too bad they keep getting stabbed in the back. Was what Emori said about all the minds being lost if the City of Light is destroyed true? Yikes. Are contracts in negotiations or something? Is the City of Light in outer space now? Or is it in the same make believe place it's always been? It's a special kind of heinous that the people who lived on the Ark dreamed of nothing else but getting to the ground. Then, miracle of miracles, they made it. Now ALIE has hijacked them and taken them back into space?? Wow. Jaha: "Emori, you know you can correct your defects here." Luna: "You don't want saving. You want someone to fight with you." Octavia: "Damn right. We're at war." Harper: "I was just thinking, it's been two days with no one trying to kill us." Luna: "People I loved died today. Needlessly. At my hand. I can't let that happen again. As we prepare to give our brothers and sister to the sea, we honor their lives. From water we are born, to water we return." Luna: "You believe that to defeat an enemy who will stop at nothing, you must stop at nothing. How's that different than 'blood must have blood'?" So, so sorry about my late reviews this week. I too like Luna. I think she knows that she was raised to pretty much be a killing machine and to lead a killing machine, so I think she's afraid that once she takes on the chip, she won't be able to stop herself from following that path. She may also truly be a pacifist who does think that killing for any reason is wrong. Plus she may think once Skikru is off the oil rig, they will be safe from the outside world, so it's not her fight. I'm of mixed minds as to whether Jaha is controlled by ALIE. I tend to think he is. Yes, he's the one who knows how to apply emotional manipulation, but that's inherent knowledge, not intent. I see ALIE as taking over everyone's intent and controlling what they want to do. Abbie still knows her medical training. Emori remembers her days of thieving and knows how to do that. Jaha seems like he's a co-leader with ALIE, but I have trouble thinking he would knowingly and willingly give up memories of Wells. Basically, I won't be surprised either way. Monty and Harper make sense. Getting stuck in cages together and having bone marrow harvested can bring people closer the one can imagine. So I guess it wasn't because he was the only straight guy around. That scene got me thinking that I want Harper and Miller in the main cast. The show has been killing too many recurring characters lately. On the rig it got me thinking. After Luna killed everyone who was working for ALIE the AI was still there watching so someone must still be chipped. Luna, Jasper and the girl were the only ones in the room after the fight was over. My take on the only left option to take down ALIE is to find some of the stuff Bekka used to alter her DNA and use it on someone (Clarke is the obvious choice) and insert the Flame in them. 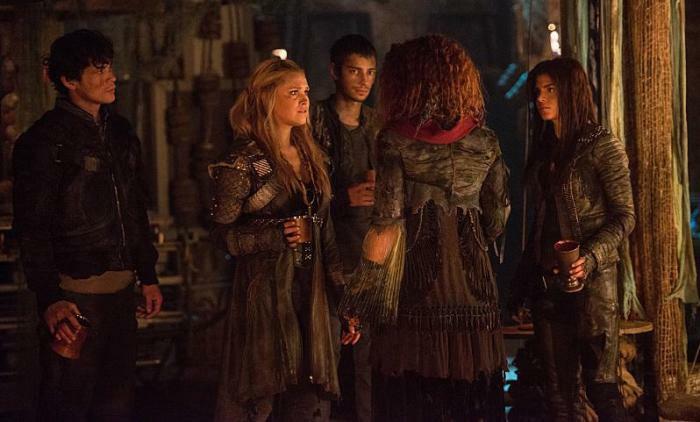 I hope the finale will blow me away because to be honest the AI hivemind plot basically erased the main conflict of the series: the politics of the Grounders and how the Sky People fit in.